Happy Bloggers Challenge Friday! Thanks to those who played along with last weeks Feminine Touch Challenge. This weeks challenge is Tags! I created a Mixed Media Tag using the Gelli Arts Plate, and stamps from Artistic Outpost. After the Gelli Arts Background was created and dried, I used the Wet Embossing with Stencils Technique from Club CR8 to add the White Damask to the tag. If you'd like to play along with this weeks Bloggers Challenge, please link back to this post on your blog and mention you created your card for the Bloggers Challenge Tag Challenge. Please add your link using the Link Tool below, your link should be a direct link to your Bloggers Challenge Post, use your name as the Title. Please do not link to cards that were created prior to the challenge date. Entries not linking properly, or backlinked will be removed. If you have the captcha enabled on your blog, please consider turning it off, as it makes it so much easier to leave comments. 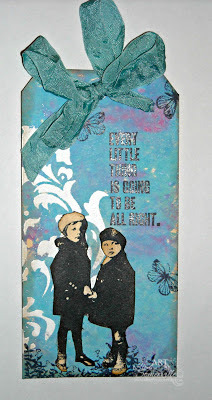 This is adorable in the blues...love that stenciling on the bg, and those cute kids. So love that background on your tag and those little cuties look right at home! Gorgeous! Happy Weekend and Happy Mother's Day! So cool... the scale of the patterns in the background makes the two of them seem even tinier and more vulnerable, but the colours support the sentiment - it will be alright! Fabulous tag.